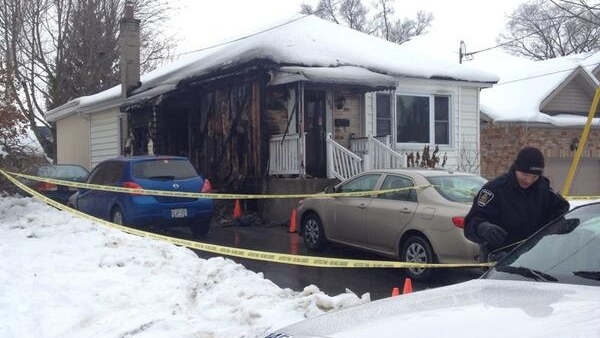 London police say a weekend arson and subsequent death of a man is now an attempted murder-suicide investigation. Officers responded to a call at 152 Columbia Ave., in the Oxford and Woodward area around 5:30 Sunday morning. Police say a man tried to set fire to the outside of the home and then fled the scene in a vehicle, nearly striking two people from the home. The vehicle got stuck in the snow and a foot chase ensued with the canine unit that led to the backyard of a Woodward Avenue house. Police say the man was found dead and foul play is not suspected. Police say the man was the ex-husband of a woman who had lived at that address with him. The woman, who police believe was the target of the attack, was not in the home at the time, but several of her family members were. One of the family members became aware of the fire and alerted the others, who range in age from 26 to 68 years old. They all escaped. Police say the man fled the scene in silver Chrysler PT Cruiser. They say he drove a short distance before turning around and driving at the two residents. The male then lost control of the car and fled. They say a search of the male’s car yielded a number of incendiary devices and accelerants. Spent fireworks were also found at the scene. Images captured on a privately owned security system in the area assisted with the investigation. While there are no other suspects, the major crime section is still investigating to determine if there were any more criminal offences. The deceased man’s relatives do not live in Canada and police say they will not release his name as doing so would so would identify his ex-wife.